Auto polo match in the 1910s. Malletmen were often thrown from the cars during matches. Automobile polo or Auto polo was a motorsport invented in the United States with rules and equipment similar to equestrian polo but using automobiles instead of horses. The sport was popular at fairs, exhibitions and sports venues across the United States and several areas in Europe from 1911 until the late 1920s; but it was dangerous and carried the risk of injury and death to the participants and spectators. 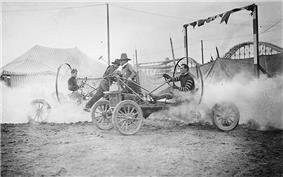 The official inventor of auto polo is purported to be Ralph "Pappy" Hankinson, a Ford automobile dealer from Topeka who devised the sport as a publicity stunt in 1911 to sell Model T cars. The reported "first" game of auto polo occurred in an alfalfa field in Wichita on July 20, 1912 using four cars and eight players (dubbed the "Red Devils" and the "Gray Ghosts") and was witnessed by 5,000 people. 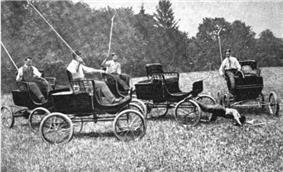 While Hankinson is credited with the first widely publicized match and early promotion of the sport, the concept of auto polo is older and was proposed as early as 1902 by Joshua Crane, Jr. of the Dedham Polo Club in Boston, with the Patterson Daily Press noting at the time of Crane's exhibition that the sport was "not likely to become very popular." Auto polo was also first played in New York City inside a regimental armory building in 1908 or 1909. The popularity of the sport increased after its debut in July 1912, with multiple auto polo leagues founded across the country under the guidance of the Auto Polo Association. The first large-scale exhibition of auto polo in the eastern United States was held on November 22, 1912 at League Stadium in Washington, D.C. By the 1920s, New York City and Chicago were the principal cities for auto polo in the United States with auto polo matches occurring every night of the week. In New York, matches were held at Madison Square Garden and Coney Island. Internationally, auto polo was regarded with skepticism and caution. In 1912, the British motoring publication The Auto described the new sport as "very impressive" and a "lunatic game" that the writers hoped would not become popular in Britain. Hankinson himself promoted auto polo in Manila in the 1910s with events sponsored by Texaco and recruited teams in the United Kingdom. Auto polo was further spread to Europe by auto polo teams from Wichita that toured Europe in the summer of 1913 to promote the sport. In Toronto in 1913, auto polo became the first motorsport to be showcased at the Canadian National Exhibition, but the sport did not become popular in Canada. The Dedham Polo Club first used Mobile Runabouts for their exhibition game in 1902. Unlike equestrian polo which requires large, open fields that can accommodate up to eight horses at a time, auto polo could be played in smaller, covered arenas during wintertime, a factor that greatly increased its popularity in the northern United States. The game was typically played on a field or open area that was a least 300 feet (91 m) long and 120 feet (37 m) wide with 15-foot (4.6 m) wide goals positioned at each end of the field. The game was played in two halves (chukkars) and each team had two cars and four men in play on the field at a given time. The first auto polo cars used by the Dedham Polo Club were unmodified, light steam-powered Mobile Runabouts that seated only one person and cost $650 (equivalent to $17,717 today). As the sport progressed, auto polo cars resembled stripped down Model Ts and usually did not have tops, doors or windshields, with later incarnations sometimes outfitted with primitive rollbars to protect the occupants. 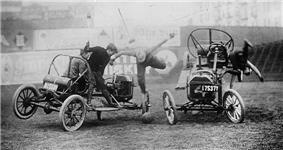 Cars typically had a seat-belted driver and a malletman that held on to the side of the car and would attempt to hit a regulation-sized basketball toward the goal of the opposing team with the cars reaching a top speed of 40 miles per hour (64 km/h) and while making hairpin turns. The mallets were shaped like croquet mallets but had a three-pound head to prevent "backfire" when striking the ball at high speeds. Due to the nature of the sport, cars would often collide with each other and become entangled, with malletmen frequently thrown from the cars. Installation of rollcages over the radiator and rear platforms of the cars helped prevent injuries to players, but falls did result in severe cuts and sometimes broken bones if players were run over by the cars, though deaths due to auto polo were rare. Most of the cars would usually be severely wrecked or demolished by the time the match was finished, leaving most players uninsurable for costly material and bodily damages incurred during the game. A tally of the damages encountered by Hankinson's British and American auto polo teams in 1924 revealed 1564 broken wheels, 538 burst tires, 66 broken axles, 10 cracked engines and six cars completely destroyed during the course of the year. The sport waned in popularity during the late 1920s, mostly due to the high cost of replacing vehicles, but did have a brief resurgence in the Midwestern United States after World War II. A recent variant of auto polo played with motorcycles, called "moto polo", was developed in Rwanda in 2008 by Sam and James Dargan. The game is played in 15-minute quarters with five players per team using mallets to hit a ball made of banana leaves. The sport has few definite rules beyond "motorcyclists cannot use their feet to kick the ball and players cannot stick objects into motorcycle wheels". Auto poloists chase each other down the field in a 1913 photograph by Collier's Magazine. 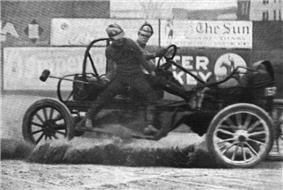 A malletman balances on the side of a moving auto polo car during a match in 1913 in a photograph by the International News Service. 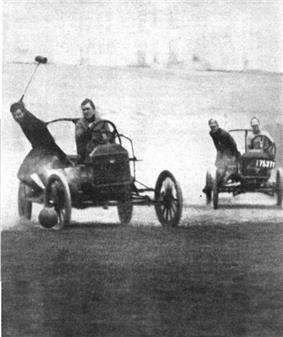 An auto polo match at Bain News Service. Cars had primitive metal hoops around the driver's seat and radiator to protect the occupants in the event of a rollover. A rollover during a match in a most likely staged circa 1910—1915 photograph by the Bain News Service. ^ a b c d e Carlebach, Michael (2011). Bain's New York: The City in News Pictures 1900-1925. New York: Courier. p. 143. ^ Staff (July 21, 1912). "Automobile Polo Game". New York Times. ^ a b Morrison, R.H. (1913). "Playing polo in autos". Illustrated world 19: 103. ^ Staff (18 July 1902). "Auto polo latest fad". Patterson Daily Press. Retrieved 23 August 2012. ^ a b c d e Perry, Ralph (July 3, 1924). "Miami's new sport will provide thrills for fans". The Miami News. Retrieved 23 August 2012. ^ Staff (January 1913). "Britains fear auto polo". Automobile topics 28: 608. ^ Texas Company (November 1915). "Texas Star". The Texaco Star 3: 31. ^ Staff (May 3, 1913). "Auto polo for Europeans". Lawrence Journal World. Retrieved 23 August 2012. ^ a b c Dinka, Nicholas (August 2005). "Auto Pilots". Toronto Life 39 (8). ^ a b c Staff (October 1929). "Auto Polo". The Billboard 41 (40): 65. ^ Inkersley, Arthur (August 1902). "Auto polo". Western Field: The sportsman's magazine of the West 1: 401–402. ^ "The Mobile Company's lighest carriage". The Cosmopolitan 33: 793. October 1902. ^ Staff (September 21, 1922). Play to win" is slogan of auto poloists""". The Southeast Missourian. Retrieved 23 August 2012. ^ Staff (Sep 2, 1925). "AUTO POLO COSTLY AND HAZARDOUS: Even Lloyds Won't Insure Players". The Hartford Courant. p. 2. ^ Staff (May 27, 1949). "Photograph". The Milwaukee Journal. Retrieved 23 August 2012. ^ Kron, Josh (May 8, 2012). "A Lot Like Polo, Only Faster and With Beer". The New York Times. Retrieved 24 August 2012.